In interview to Russian media Syrian president admits Iran giving military support, but denies troop presence despite numerous reports. 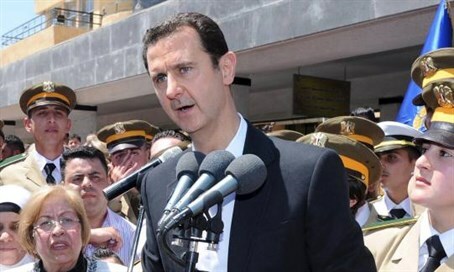 Syrian President Bashar al-Assad made an unusual claim in an interview with Russian media, stating that his backers in Iran haven't sent him an "army" - despite repeated reports that hundreds if not thousands of Iranian soldiers are fighting in Syria to prop up his regime. Assad said it was natural for Iran to have stepped up its decades-old military and economic support for Damascus at a time of war, according to a transcript made available on Wednesday. Assad is of the Alawite group, a sect of Shi'ite Islam; Iran is the major Shi'ite nation, partially explaining its willingness to back Assad against his Sunni rivals. The Syrian president told the media outlets from Russia, a major ally, that Tehran's support was essential for his regime in Syria's conflict, which has cost more than 240,000 lives since 2011. "Iran supports Syria and the Syrian people. It stands with the Syrian state politically, economically and militarily," he said. Making his unusual claim, he continued, "when we say militarily, it doesn't mean - as claimed by some in the Western media - that Iran has sent an army or armed forces to Syria. That is not true." "It sends us military equipment, and of course there is an exchange of military experts between Syria and Iran," he said. "This has always been the case, and it is natural for this cooperation to grow between the two countries in a state of war." Despite his protestations, an Israeli security source just last Thursday confirmed that Iran has sent hundreds of Iranian Revolutionary Guards soldiers to fight for Assad. Assad's claim also comes despite the fact that top Iranian generals have been killed fighting in Syria, as reported in Iran. Iranian media runs regular reports on fighters killed in the Syrian conflict, but describes them as "volunteers" helping to defend Shi'ite holy sites in the country. Experts and Syrian officials revealed in an April report that Iran is spending $35 billion a year to prop up Assad's regime, and is likewise deploying thousands of its troops in the country. The reason for this is that Iran needs to maintain a route of access through Syria to the Mediterranean by which it can supply weapons to Hezbollah and strengthen its growing regional influence. Speaking to Russian media, Assad said that with strong ties which date back "three and a half decades," Iran's support is now "essential in this difficult and ferocious war." Syria was the only Arab state to side with the Islamic republic during its 1980-1988 war against Saddam Hussein's Iraq. Assad also spoke about the Syrian refugees fleeing en masse to Europe, and criticized the West for supporting "terrorists" - Syria's government labels all those involved in the anti-Assad uprising and ensuing civil war as "terrorists," including Western-backed rebels. The West is "crying" for refugees flooding into Europe but its support for "terrorists" in his country lies at the roots of the crisis, according to the Syrian despot. "Those refugees left Syria because of the terrorism, mainly because of the terrorists and because of the killing, and second because of the results of terrorism," said the embattled leader. "When you have terrorism, and you have the destruction of the infrastructure, you won't have the basic needs of living," Assad said. "So, the West is crying for them, and the West is supporting terrorists since the beginning of the crisis when it said that this was a peaceful uprising." "If you are worried about them, stop supporting terrorists...this is the core of the whole issue of refugees."